2P START! Live! : 120 to 12 Edition | 2P START! 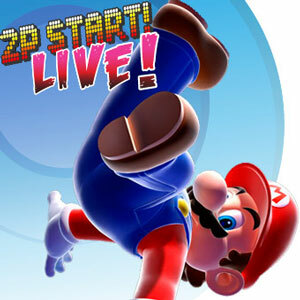 Here’s our latest podcast (rss, mp3, iTunes), discussing Mario Galaxy and a host of other topics. We have another trivia question for you guys as well as a sneak peek at what’s in store for 2P START! this week, so check it out! That was the most passionate podcast ever X) Very funny, though. Glad to hear that you guys are updating the site but sad to hear that there won’t be a comic (from you at least). Cool. After saying a few days ago that I didn’t listen, this is AWESOME! I didn’t exactly understand the black doom thing, but, ah well. Looking forward to the next one! Of all the podcasts I’m starting to listen to, you guys are the only ones that have background music/sound. I like you guys because of that. Arolli, I got Super Mario Galaxy (Well, preordered) it for $40!. Anyhoo, I don’t want to listen to this one incase there’s spoilers. Also, I’m not letting myself watch any videos of it. Kidding aside, you guys have a great thing going. Keep up the comic, keep the podcast. You’ve got amazing talent and the podcast is a great supplement to the site/comic. Nintendo, FTW! Oh and I can only guess that the first video game music challenge is from a Castlevania…but that’s all I got. Sorry boys! Cozm0, you made our day with that comment! We meant no insult by it and appreciate you listening in! Also, I hope the finger is feeling better. Daniel, I hear you on that (it was me that is pacing myself on Mario Galaxy). I’m taking it one star at a time! I’ve only got “Montgolfier and the Romantic Balloons,” and the Brothers Martin Album, but yeah, I like a fair amount of his other stuff. Whoops, wasn’t quite done, and hit submit. So much for spellchecking/editing. Uh… I guess I was just going to ask that you keep us up to date on the project. I also would like to give Tim props for being cool at the Toys R Us, cause there are a lot of people who can’t handle stuff like that… I mean, there’s more to worry about in life right? Like… do I have enough food to live? If the answer is yes, you can breathe a sigh of relief and enjoy your circumstances. Ha, sorry I don’t mean to clog your comment space with a weird ranty tangent. Yeah, it is feeling mush better (as you can see in my typing) and anyways, is the song from Fire Emblem? I’m taking a guess that this is Final Fantasy? I don’t really play many games that sound like that. Great podcast ^_^, I’m not usually a “podcast guy” but I’ll definantely be listening from now on. I need GALAXY T_T, oh well, Megaman ZX Advent will have to do for now! you guys got me into podcasts. hey, is the song from kid icarius? o and btw. this site used to be good but then you changed the thing at the top. This trivia is from Skies of Arcadia! It’s the main theme/intro from the opening. <3 Spectacular game. Wish I could've been around to answer this earlier.